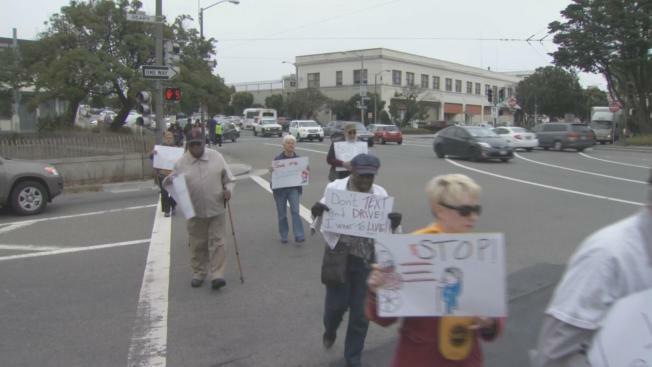 Seniors and people with disabilities gathered in San Francisco on Friday to demonstrate how, even in a crosswalk, they face dangerous situations and lack sufficient time to make it across the street. Carrying signs that said, "Give me time to cross," the group crossed Masonic Avenue and Geary Boulevard. According to Cathy DeLuca of Walk SF, “Seniors are five times more likely than other adults to be killed in a crash in San Francisco." San Francisco leaders have adopted an initiative called Vision Zero to improve pedestrian safety. To that end, the SFMTA pointed out the area has two street design projects that should boost pedestrian safety. One way is to extend curbs so as to reduce crossing distance at some intersections; another is to upgrade stop lights. The entire report by NBC Bay Area’s Christie Smith is above.